This product is currently un-available and we have yet to find a suitable replacement. This conditioner was what we felt was the premium and best in the industry compared to several other name brand Electronic Water Conditioners. And, since we introduced the Hard Water Bullet, it has become much more popular because of ease of installation, cost and overall simplicity and performance.. Installing a Saltless Water Softener in your home can mean big benefits to you and your family, but also your home appliances and pets. If your currently using a Salt Based Softener and looking for a alternative then this might just be your answer. It's easy to get confused when comparing these systems because price greatly fluctuates between different brands. It really comes down to one question, always ask the salesperson how much total power (Milliamps) does their conditioner actually produce? The more Milliamps you have going through the coil, the better performance you will have. If they cannot tell you (Or will not tell you) then defiantly beware. Our conditioner produces a full 4000 Milliamps, and as far as I know, there is not another residential conditioner on the market that produces this much power. 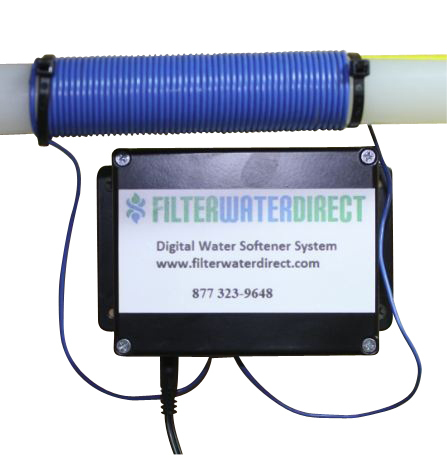 Cheaper is not better when you compare Digital Water Conditioners, your looking for a system that works at an affordable price with a good guarantee. Watch the video below to see how easy it is to install Filter Water Directs Limescale reduction System. Millions of times every second the system varies a group of electrical pulses that change the physical makeup of your water. These electrical pulses break down the calcium into fine calcium aragonite powder the size of only 4 microns , the remaining soft calcium in the water groups itself into soft snowflake-like shapes. Gaps appear between these groups of calcium flakes and allow the water to easily carry minerals, nutrients and for the formations of suds from detergents. This broken down calcium powder is fine enough that it becomes six times more dissolvable into the water itself. The extremely small size of the calcium particle creates another advantage. Heat or pressure changes will not cause the converted calcium to revert and form calcium lime scale. The surface tension of the water is also reduced by this conversion to a soft form. This increases the solubility of the water making it an even better solvent. In addition, the electrical charge of the water and minerals suspended in it are altered so calcium will not adhere to surfaces. It's always a good idea to compare Electronic Water Softener brands for price, features, warranty and specifications before you buy. Were confident that once you compare our softener to other brands, you will see why we feel this is the best overall value for your money. You should remember that cheaper is NOT better, but at the same time you can over spend. When comparing the systems, you should always use the below specifications as a basis for your decision. If the salesperson will not, or dont have the answer, BEWARE and assume that that particular system may not perform as described and offer below average results. Our Saltless Water Softener simply installs by wrapping coils of wire around the pipe and plugging it into a 120VAC wall outlet. It constantly monitors your water the result is profound! More suds, no scaling and it will begin to de-scale any existing of hard water build-up and remove it within 90 days. Filter Water Direct specializes in "GREEN" Water Treatment Solutions and will always help you choose the best system for your needs! Only use this system on plastic or copper pipe. Use one wrap on plastic pipe and two wraps on copper pipe.